These shelving systems all incorporate Rakks products, and are all located on the West Coast. These contemporary residential spaces are located in Seattle, San Francisco, and Los Angeles. The first space featured is a Seattle staircase, the second is a high-rise apartment on Russian Hill in San Francisco, and the third is a modern Los Angeles ranch-style residence. Rakks Brackets and Wall Mounted Standards played a supporting role in transforming this Seattle staircase into an outdoor-inspired space. 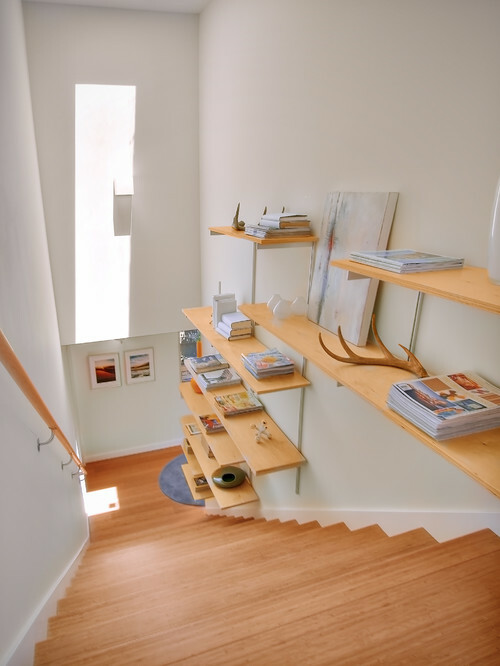 The sturdy wooden shelves pictured are on Rakks Style Brackets and have a natural finish, and help contribute to the relationship between the outdoors and the open-air staircase. The finish on the steps complements the shelving, and the illumination of the skylight ties the room together from top to bottom. The shelves are staggered amongst the standards, and have an organic height and spacing. This photo was taken in the inception of this now-occupied space in a Russian Hill high-rise. 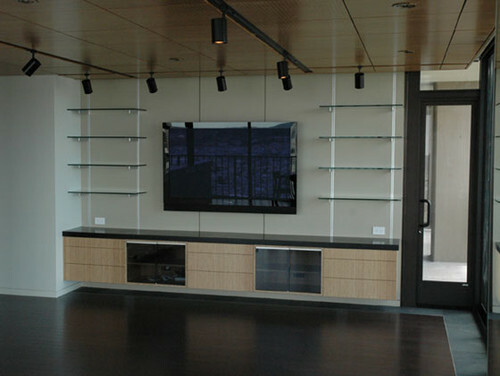 Using Rakks Shelf Support Brackets, this entertainment center stacks glass shelves mounted on Rakks Standards above bamboo cabinets. The hanging bamboo cabinets compliment the drop-in wooden ceiling. “This is on the 23rd floor of the Eichler tower on Russian Hill. Very clean and simple lines hide the detail involved.” – Creative Spaces, Inc.
Design/Photo by Creative Spaces, Inc. 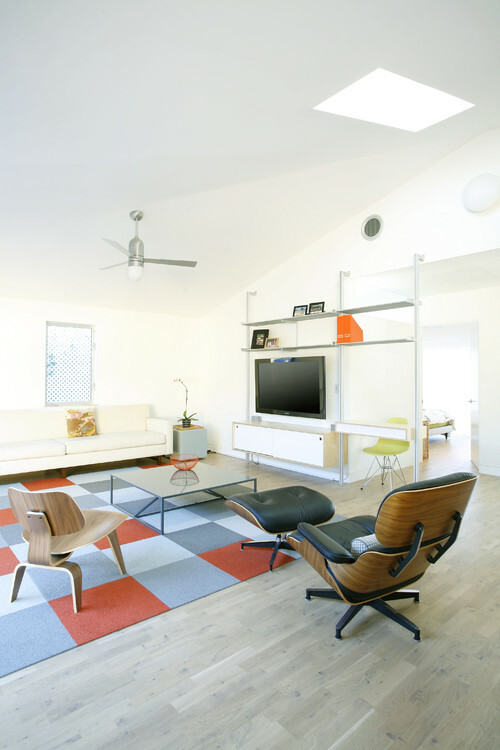 This Los Angeles living room got custom makeover incorporating Rakks Shelving. Using Rakks Aluminum Shelves and Pole Mounted L-Brackets, ras-a, inc. was able to create an entertainment area that also acts as a working desk. Because the TV and desk face the same way, the desk’s user can be part of the conversation in the room without being distracted by the TV. The custom shelving system plays a supporting role highlighting the minimalist nature of the space. “The aluminum shelves and support system are by Rakks. The configuration is custom as well as the floating cabinets.” – ras a, inc.